Building upon her insatiable childhood curiosity of the outdoors, and carrying that forward through achieving a BA in Recreation and Leisure Studies from the University of Alberta, Darcie-Lyn spends life immersed in the natural world as a Nature Lover, Program Coordinator, Addictions Support Worker, Consultant, Outdoor Education Instructor, Corporate Event Co-Facilitator, & Mountain Wanderer. During shoulder seasons, it's ideal for her to travel and share her enthusiasm for people, adventure, and curiosity of culture, space, and time . . . especially mountain, ancient, and indigenous cultures. During her time outside within different landscapes and cultures she lovingly explores the worlds of Self, Awareness, Spirituality, and Connection with others and the Earth through physical activity, adventure, the unknown, ceremony, mediation, growing & harvesting food, and whatever else grabs her attention . . . If she had to pick a 'top three' in the outdoor adventure world, they would be mountain biking, back-country skiing, and rock climbing. 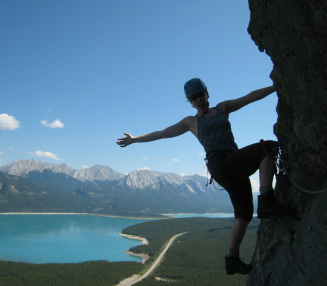 Darcie-Lyn is originally connected with some of the Essential Life Crew from her hometown of Spruce Grove as well as through living, working, and volunteering at the Centre for Outdoor Education since 2001. A strong foundation upon which to build! In her words, "I am really excited about the Essential Life Series and the opportunity to Co-Create with so many inspiring people in an absolutely beautiful natural environment! I am so looking forward to sharing my knowledge and experience, as well as sharing skills and tools others have gathered. We have explored this type of programming through the years; it's a great compliment to the existing outdoor adventure programming & qualified 'technical' mountain staff, as well as a natural progression and development of Community. Nordegg is truly a magical place. It's also been great confirmation we are on the right track, as existing clientele and our individual networks have been asking us about this type of programming as well. The reception we are receiving is super encouraging! We aren't proclaiming to have all the answers, however, we are consciously choosing to Co-Create a Community, while being aware of living as harmoniously as possible within our natural environment of a beautiful Rocky Mountain refuge, where we can safely explore all the options. It's exciting and empowering! Looking forward to having you out to explore and experience it your way as well!"